Christmas is one of the best time of year to be a beauty addict - some brands bring out gift sets which are amazing value compared to their usual lines of singular products, and Benefit is one of them. I remember in my mid-teens Benefit was the first semi-high end brand which caught my eye, and every year I'd have some of their gift sets at the top of my Christmas list. Fast forward more years than I'd like to admit, and I'm still their Christmas offerings are still amazing - these are my top picks for this year. My favourite of all the Benefit gift sets this year is the cheeky sweet spot palette, more on that in a sec. The fun size flirts gift is a lovely mixture of Benefit's best minis giving a full taste of the range - perfect for any Benefit fan, but also anyone who's new to the brand. Cutie cravings is also a lovely complete gift set which includes Hula bronzer, four neutral eyeshadows, a mini porefessional, bad gal mascara and a lip gloss. Sweet Tintations is an amazing value set as you get a full size of both the benebalm and lolibalm which are usually £14.50 each, plus minis of benetint and lolitint. And Complexion Confections is a slight variation on a gift set which I got for Christmas last year featuring the triple performing facial emulsion and it's potent eye cream (which I love - review here). You also get a minis of the porefessional and instant comeback facial serum, all for less than the price of the moisturiser and eye cream if you bought them individually. I'm planning to pick up the sweet tintations gift set, but the one I rushed out to buy first for fear of it selling out is the blush palette. I think I had the right idea, because I found it had to find the cheeky sweet spot in stock online at some of the usual places, but it is currently still available at House of Fraser and direct from Benefit. You get mini sizes of six of Benefit's famous blushes and bronzers, but although they are mini compared to their boxed up cousins, you're actually getting a lot of blush. Each of the minis in this palette is equivalent to about half of one of the full priced boxed blushes which cost £23.50 each, so at £29.50 for the palette, no wonder this is selling out! The blushes included in the gift set are dandelion, bellabamba, sugarbomb, hoola, coralisata and rockateur. You also get a mini blush brush and mini watt's up creme highlighter. Do you have any Benefit gift sets on your Christmas wish list? I've been lusting over the cheeky sweet spot kit for a while, I just found it hard to find! I'm so tempted to swatch it, but my Mum would kill me as it's for Christmas! 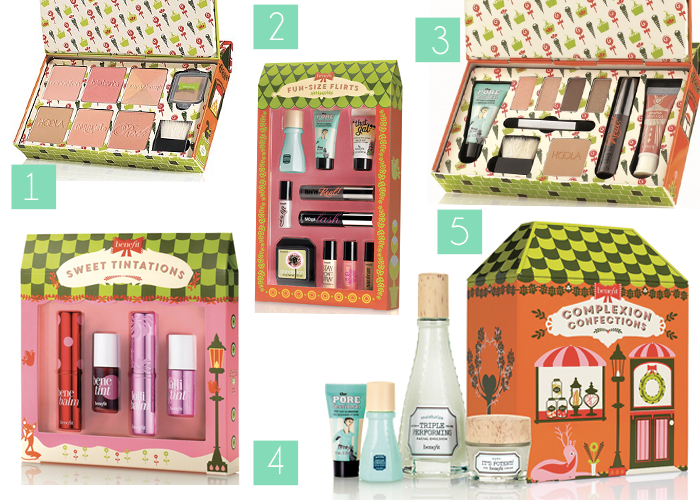 I love the look of all these kits, Benefit always do amazing Christmas gifts! These look gorgeous. Very beautiful.